There would, of course, have been no chariot races without the horses. 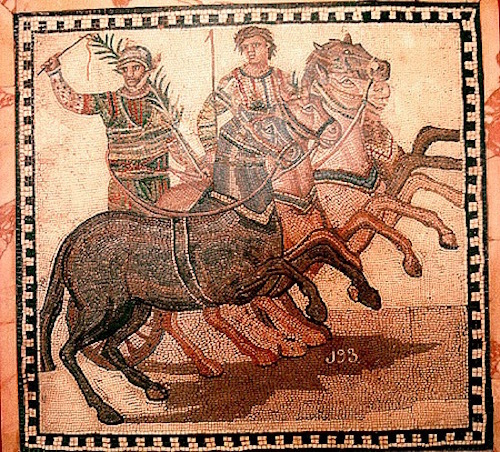 As in our day with the Kentucky Derby and other races, horses for the chariot races were specially bred. 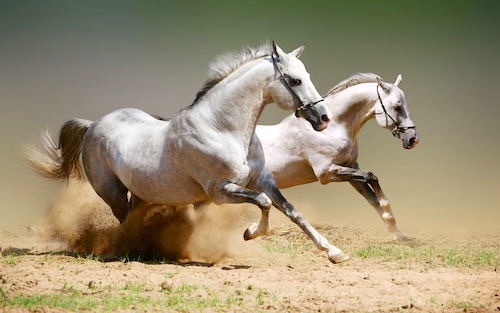 The Spanish-bred Andalusian horses were considered the best and it is not incidental that some of the greatest heroes of the ancient races, including young Scorpus and Diocles, were born in Iberia, in Spain. 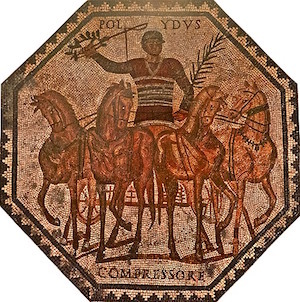 The lead horse in a chariot race was often as famous or more famous than the driver. Sports fans knew the breeding line and the intimate details of the horses they adored. 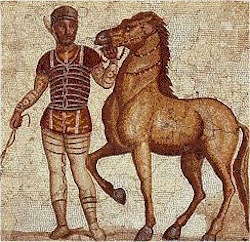 A Roman mosaic of two famous race horses called Diomedes and Aicides. Notice they are surrounded by the palm leaves of victory. 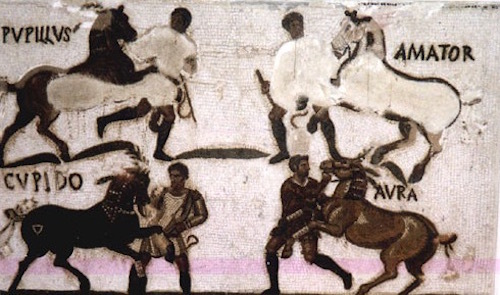 Some of the names of hero race horses were: Abigieus, Lucidus, Cotynus, Galata, Pompeianus. 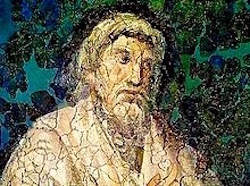 The names mean nothing to us now, of course, but the mere mention in the stadium of “Abigieus” would drive the people crazy. Emperor Nero was crazy and was a fan of a horse called Incitatus. 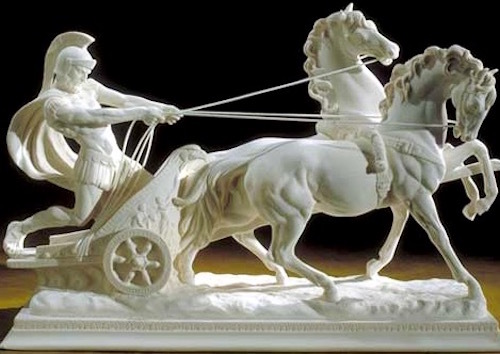 Incitatus was so important to Nero that the horse had its own marble stable, ivory stall, purple blankets, jeweled collar and his own furnished house and team of slaves. The Spanish Andalusian horse, known as the Horse of Kings, had been used by Roman and other Generals of armies as a war horse for centuries before the chariot races. They were/are strikingly beautiful horses. standing at about 15.1 hands (61 inches), and are intelligent, docile and sensitive to humans. The forward thrust of their haunches gave them power and just enough speed to gallop the straightaways and still be able to negotiate the dangerous turns at the two metae, the turning posts where most of the riders could overturn and be trampled to death. The chariot, driver and horses had to complete 7 full laps around the Circus Maximus for a total of about 3-4 miles. The lead horse, the best and most experienced horse, was on the inside of the charioteer’s left and often became as famous as the charioteers. 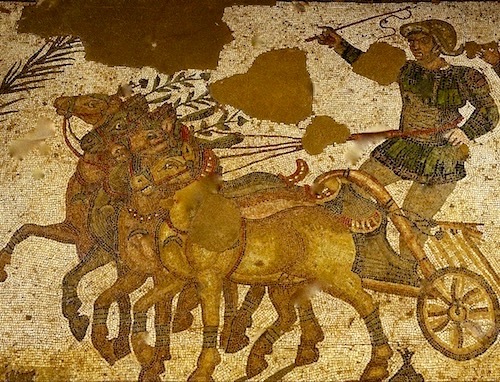 The image below is of a charioteer driving for the Red Faction. There were four racing teams—the Reds, the Blues, the Greens and the Whites. This driver for the Red Team has the palm branch of victory in his right hand. To the cheers of the audience of up to 250,000 people, he is parading his team several times around the Circus Maximus. 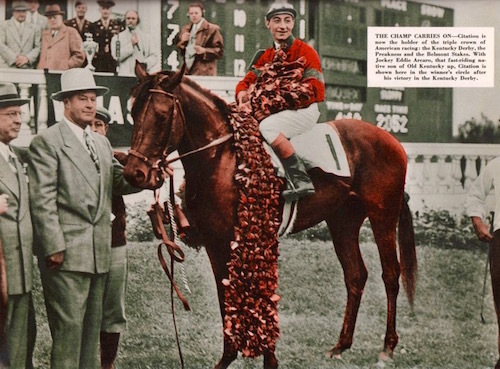 Eddie Arcaro on Citation in 1948 upon winning the Kentucky Derby. Citation went on to win the Preakness and the Belmont Stakes—the Triple Crown. 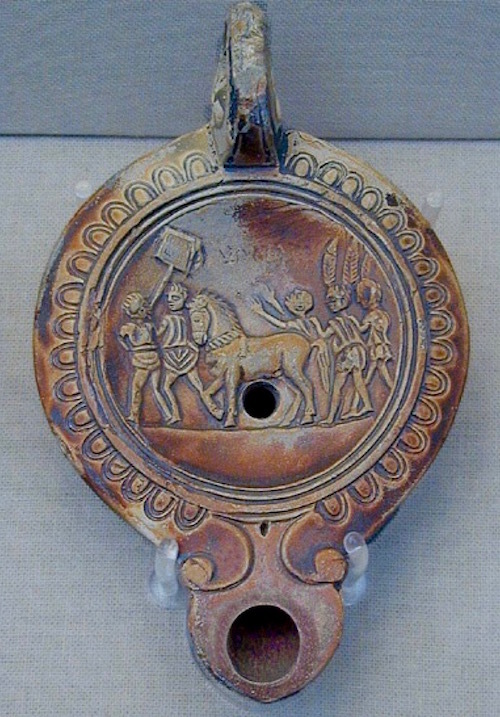 Below is a Roman lamp featuring the lead horse in a chariot race. The placard the man ahead of the horse is carrying would bear the horses’s name and the number of victories he had won. In the 1400’s Carthusian monks began rescuing and breeding Andalusian horses. They kept impeccable records of breeding habits and lines of breeding that are still studied today. The horse they bred and “saved” is now called a Carthusian Andalusian horse. 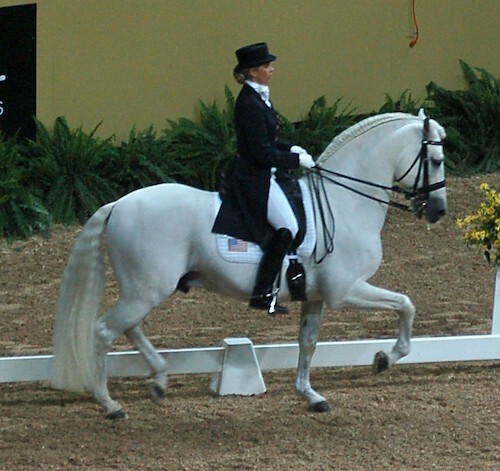 Today Andalusian horses are the most elegant of dressagers. If you would like to buy one, here’s a video (below). Price range is c. $5,000 to $50,000 or more.